During the early summer of 2011, while revising the Concise Scots Dictionary, I was searching for a word I knew to be of Traveller origin. I was searching The Scottish Traveller Dialects by Jess Smith and Robert Dawson, an excellent source for words used by Travellers1 — but one which is arranged in the form of informant lists without definitions or grammatical information, which limits its use as a resource. It occurred to me that it would be very useful for my own work to rearrange this information into a single alphabetical list, and as I worked on compiling it, I came across other modern and historical sources which would very usefully augment the original material. It soon became clear that this work had blossomed into what would become a fully-fledged dictionary. In Scotland today, Gypsies and Travellers speak a mixture of different languages: Scots, Cant, Romany, Scots Gaelic, Irish Gaelic, Shelta (the language of Irish Travellers) and Beurla Reagaird. The latter is a form of Gaelic which involves backslang, for example the Gaelic for horse is capal which in Beurla Reagaird becomes lupac. Through the generations there has been a great deal of socio-linguistic contact between these various groups, facilitated, for example, through intermarriage. My interest in the language of the Travelling Community began in childhood when I became friends with a Gypsy girl at primary school, and was exposed to words from her language. Linguistic contact of this type was not unusual in southern Scotland where there was a legal requirement for Gypsy children to attend school for a minimum number of days each year. In this way quite a number of Gypsy words were borrowed into the vocabulary of Scottish school children. These words often survive in Scots (where they have been lost elsewhere). There are many other words of Romany or Cant origin which have passed into Scots, which are not found in English. For example the noun peev or peeve, meaning an alcoholic drink or more specifically whisky; the verb peevan to drink alcohol; the adjective peevie meaning drunk intoxicated: “I’d be trash to fek okrie off her for she’s a peevie old manishi.” [I’d be afraid to take anything from her because she’s a drunken old woman. ]; and peever, a drunkard. A further example of a Romany word which has passed into Scots is hirie, which now means ‘money’, but originally meant a half penny or penny, from hira, hirae, hirie. It is interesting to note that hiries is used in modern Edinburgh Scots to mean money in general. Its use was popularised by the Edinburgh author Irvine Welsh in his 1993 novel Trainspotting. 1 Jess Smith and Robert Dawson, The Scottish Traveller Dialects (Blackwell, 2002). 2 Walter Simson, A History of the Gypsies, with Specimens of the Gypsy Language (Sampson Low, 1865). Facsimile edition published by Elibron Classics 2007, p.98. 4 Heinrich Moritz Gottlieb Grellmann, Dissertation on the Gipsies, (W Ballantine, 1787). Facsimile edition published by Elibron Classics 2005, p. 83. 7 Captain Francis Grose, Captain Francis and Pierce Egan, Grose’s Classical Dictionary of the Vulgar Tongue (Sherwood, Neely, and Jones, 1823. Undated facsimile edition published by Nabu Public Domain Reprints. 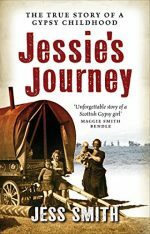 8 Jess Smith, Jesse’s Journey (Birlinn, 2003) p. 18.